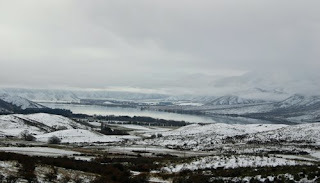 We knew that we might have trouble coming down to Wanaka because a couple of days earlier there had been a heavy dump of snow in the high country. We purposely changed our normal course from the Geraldine/Fairlie/Tekapo route to a Timaru/Waimate/Kurow route. It probably was just as well that we took this route because as we were coming up the slight hill (356m above sea level according to the GPS) between the dams & Otematata this is the view we had. It really was a beautiful snowy scene with the glassy lake in the background. Not long after stopping to take this photo we got a stone chip in the windscreen on the passenger side not far from where it connects with the door column. We got to Omarama at about 3pm & there was snow lying on the ground so we were really hoping we would get through the Lindis Pass. We saw a couple of huge trucks rumble past us so we knew the pass must have been open so we kept going all the time hoping we would get through before it was closed again. We got through fine although we were driving slower than usual. To our surprise there wasn't much snow lying on the ground. We arrived in Wanaka at about 5:15pm.